Add some Parisian chic to your bedroom with these stunning bedspreads which run from soft pastel shades to wild extravagant florals or maybe something tactile. 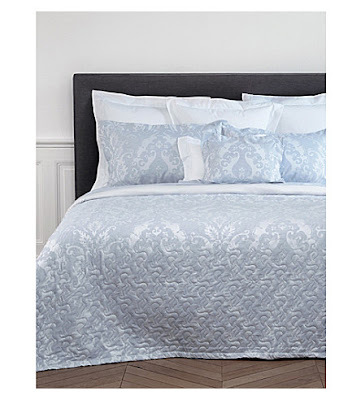 Yves Delorme brings a long history of high quality manufacturing, with superb materials blended with patterns and design bringing luxe design to your bedroom décor. 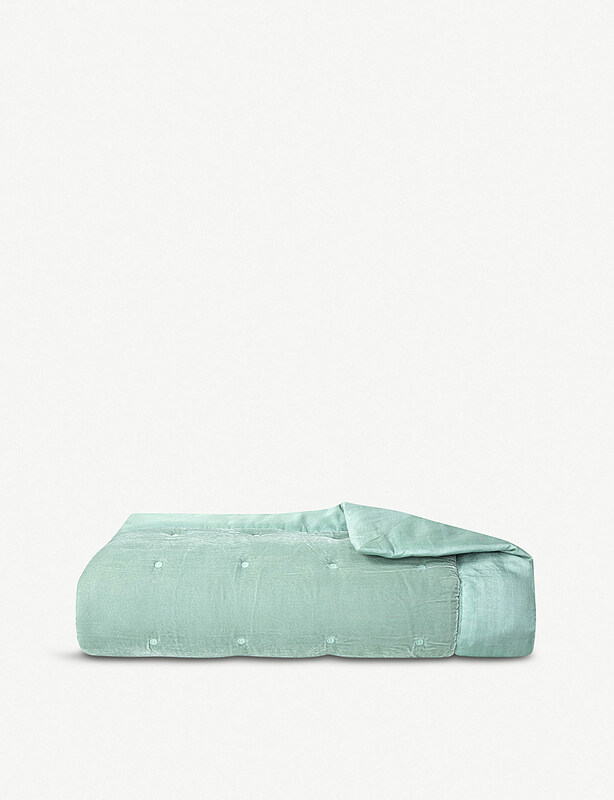 Dressing our beds with sumptuous linens for more than a century and a half, Parisian brand Yves Delorme’s collections are a must-have if you are on the hunt for high quality. The Cocon bedcover throw is made of a silk velour piqué and framed with a tusser silk border to make your bed with a touch of luxury. 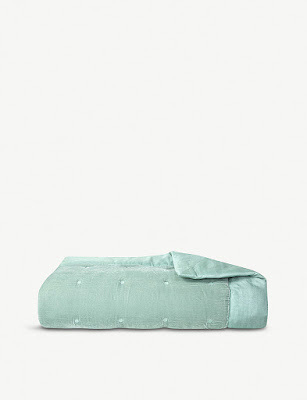 A delicate embroidery detail covers the Nymphe bedcover throw from Parisian brand Yves Delorme. Made from cotton sateen with a 300-thread count it creates a discrete but luxurious atmosphere in your room with a modern palm tree and feather pattern and arabesque stitch quilting. Reach for it on chilly nights to keep you cosy and warm. As a master of linens since 1845, Yves Delorme knows all too well that no matter the size, a bed is the focal point of any bedroom. The Parisian brand’s luxurious 300 thread-count Egyptian cotton collections form the foundations of the centrepiece, and this Triomphe bed cover tops off the swathes of silky fabric with a sateen finish. Otherwise simple by design, quilted stitching creates a button effect; perfect to layer with busier in-house prints. Yves Delorme has been sending us to sleep with style and comfort (in a good way) for almost 200 years with its linen luxury designs. Like the Neptune super king bed cover throw, perfect if you want to add elegance to your room. The damask weaved cover is made from pure Egyptian cotton with an arabesque and stylised plants design and a contrasting striped background. 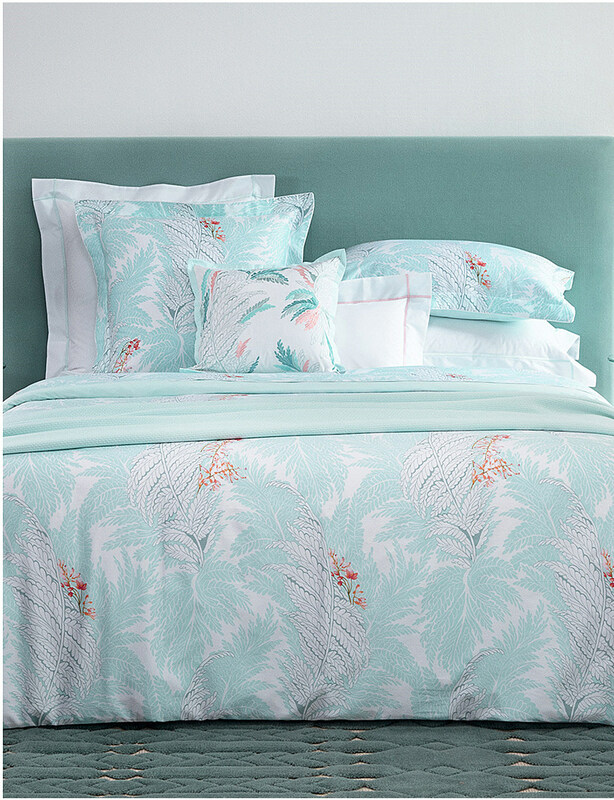 Close your eyes and feel the warmth of the tropics with the Sources bedcover throw from French-based luxury brand Yves Delorme. Inspired by the lush vegetation that grows at the heart of a forest river, it has a graphic leafy print in an arabesque quilted design for maximum comfort. Crafted from pure cotton percale it adds to your room a much needed pre-holiday atmosphere to get you in the mood. 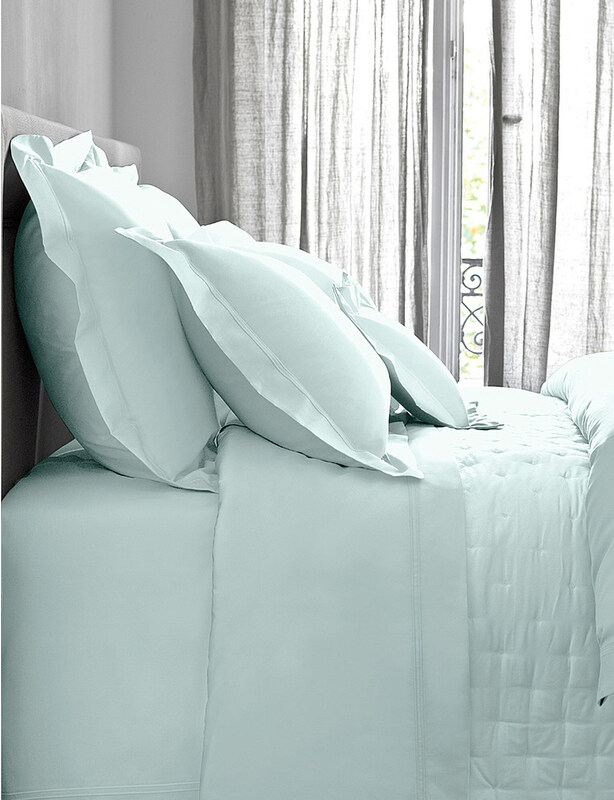 This duvet cover from prestigious luxury French brand Yves Delorme is crafted from sumptuous and quality Egyptian cotton. 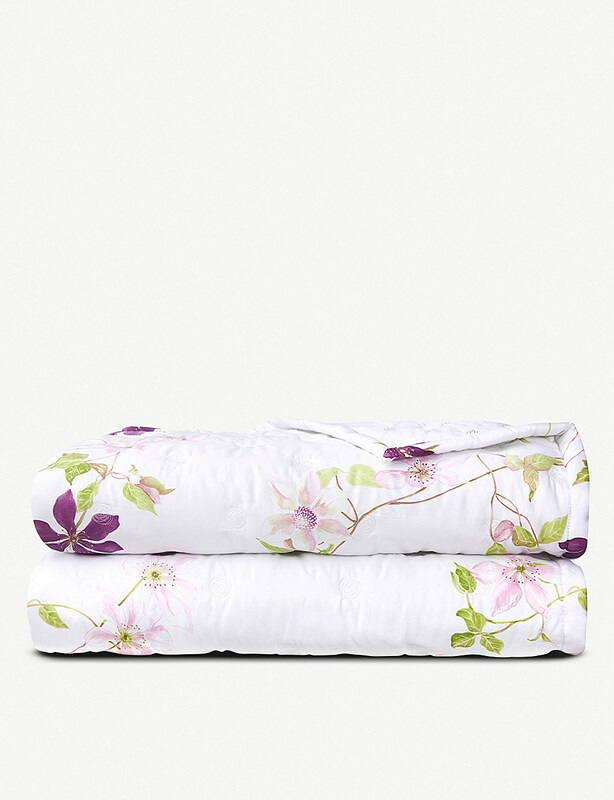 The design is from the Clematis collection which is inspired by the beauty of botanical flowers. Pink tones showcase the ornamental motifs on decorative friezes, braids and the details of jewels. 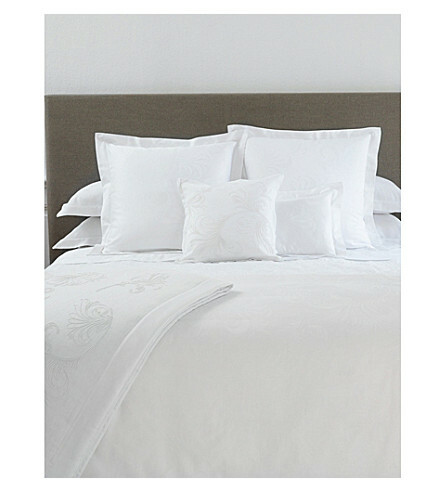 The neutral colours will perfectly compliment your well-appointed bedroom décor.